When I was an editor for The Comics Journal, I did a little feature called "Swipe File." At the time, we thought of it as a way of publicizing that common misdemeanor of comics, swipong an image or pose from some other source. It was our way of saying, "Gotcha!" In retrospect, I have a lot of sympathy for the swipers--they were usually guys on a deadline, churning out pages of comics at an industrial pace that they had no ownership rights or emotional connection to. They just needed to pay the rent, feed their kids, etc. If in a pinch they copied a pose from some earlier comic, I can understand. But back when I was assembling "Swipe File" every issue, I was a bit more moralistic about the ethics of hacking it out. Anyway, one thing I quickly realized was that all swipes weren't simple stealing. Often artists would pay tribute to an earlier master by recreating a famous panel or pose within the context of their own story. Sometimes artists would appropriate an image for ironic reasons--for example, take a heroic pose and recreate it in an anti-heroic context. And sometimes, two artists would somehow have the same idea, the same visual solution to a problem, without necessarily being aware of the others' work at all. This isn't really a "swipe" (the word implies a causal relationship between two works). What's interesting about this is that two artists make have ended up creating similar work for very different reasons. Each artist might have working through a distinct set of concerns, and the work my address these concerns while still being similar to another work. With that, consider Tony Feher's installation at Diverse Works. It consists of dozens of small clear plastic bottles, partially filled with water. They are hanging from the high ceiling of the Diverse Works space at various heights. And then over the windows, Feher has hung a curtain of white plastic bags, but it's the bottles I'm concerned with here. When I saw Free Fall, it triggered a memory. I pulled down my copy of the Art Guys catalog, Think Twice, from 1995. What I was remembering was a photo of a piece called Plastic Ellipse. So I think this is obviously not a "swipe." The works are different enough to preclude that. Besides, Free Fall easily fits within Feher's oeuvre--we can see that in his 20-year survey currently on view at the Blaffer Gallery. 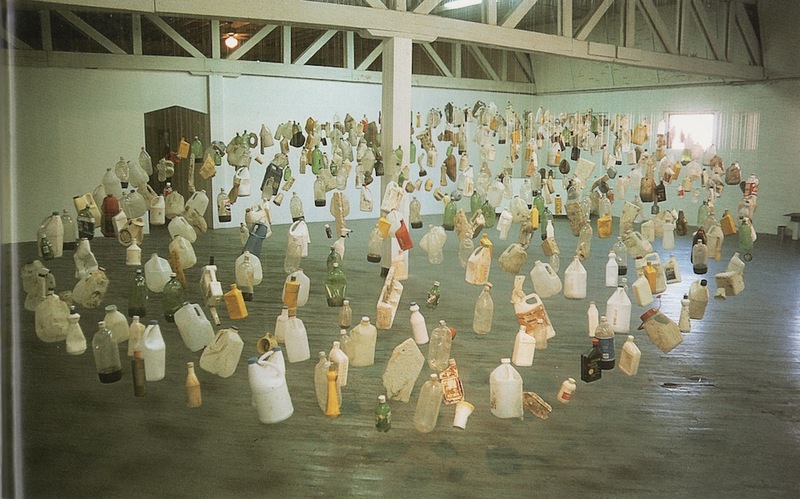 But they are also similar in an important way--they consists of plastic bottles hung from the ceiling. It's an intriguing coincidence. Black Ghost: On Not Forgetting Bert L. Long, Jr.